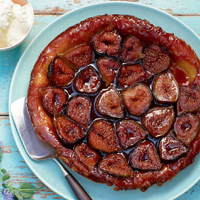 Figs are beautifully enhanced by honey, vanilla and lemon. Preheat the oven to 200c, gas mark 6. Put a 23cm oven-proof frying pan on a medium heat and melt the butter with the honey. Halve the vanilla pod lengthways, scrape the seeds into the pan, then add the pod, too. Cook for about 5 minutes until the mixture is starting to caramelise. Remove the vanilla pod, then stir in the lemon juice and add the fig halves, cut-side down, squeezing them in tightly. Cook gently until just starting to soften and turn amber. Remove from the heat. Roll out the pastry thinly to a diameter 2.5cm larger than the pan. Slide the pastry over the figs, tucking the edges down inside the pan. Bake for 30–35 minutes or until the pastry is crisp and golden. Leave to cool for 5 minutes before carefully turning out onto a plate, fruit-side up. Serve warm with cream.